Words and photographs by Angela Terrell. Travel reveals many wonders; it may be an unexpected destination, a spectacular meal, curious wildlife or scenery that far surpasses any postcard (from any era). But it can also reveal something far deeper - a sense of our place in time. Greece, renowned for the relics of its ancient civilisations, is the perfect place to really grasp the tiny role we play in the narrative of human history. Either walking over hillsides of olive groves that have seen the toil and sweat of countless generations or through the remains of amphitheatres and temples, you can’t help but be moved by the thought you’re walking in the footsteps of those who’ve come before you, who like us, were both an integral part of the big picture, and fleeting snapshots in time. 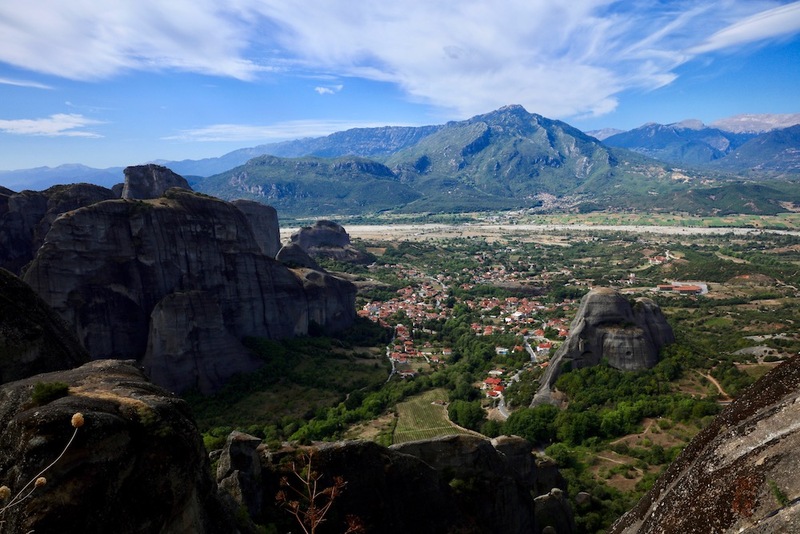 So many destinations here have withstood the eons, but it’s Meteora in central Greece where the whispers of history hold special significance, and spending time here you feel lucky to be part of its rich and varied story. Here, massive pillars of conglomerate rock rise almost vertically from the valley floor, their shapes alluring from a distance and magically morphing into elephants, monkeys and even old men with furrowed brows as you draw closer. 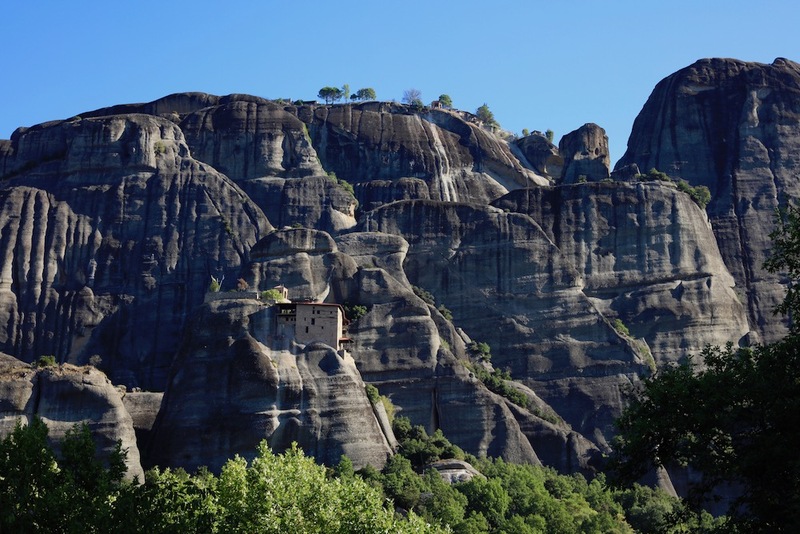 Searching for solitude, hermits once lived in the hollows of the cliff-faces, but it was monks, centuries later, in their desire to further connect with the Divine, who built an estimated 24 Eastern Orthodox monasteries atop these spectacular rock formations. Marvels of ancient engineering, they’re the perfect unity of nature, culture and history, their stalwart walls merging seamlessly with the cliff faces that plummet to the valley below. Even today the tranquil isolation the monks once sought is still palpable and, despite the tourists, you can envision the sense of protection these towers offered all those centuries ago. 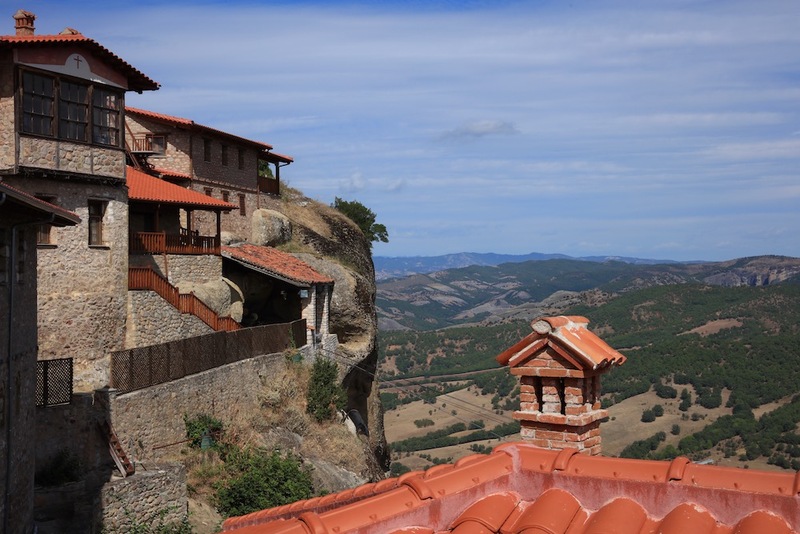 There are roads to the six monasteries that remain, but walking up to them from the valley is not only an exercise in stamina but the chance to really feel the peace the area affords. From Kastraki and Kalambaka, the nearest towns, we trekked to Megalo Meteoro, Varlaam and Agia Triada, and soon after leaving the villages with their hotchpotch of colour and delightful gardens we were climbing through a combination of cool forest and sparse, rocky vegetation baked by the sun. Constantly dwarfed by the soaring monoliths, their monasteries haloed by the sun's rays, we felt part of history as we walked, our steps further polishing the stone path already smooth from the footsteps of the monks, pilgrims and travellers who had been here before. Once at the top and seeing todays inhabitants tend the sanctuaries and their gardens, we took comfort in the thought that with such care Meteora’s story should become history's future narrative. It was later in the evening, watching the sunset from the rocks above Roussanou monastery and admiring the magnificence of the silhouetted shapes against the coloured sky, that we sought words for how we felt. Awed, humbled, amazed? Maybe they all suited. One thing for sure though, in the future there will be many more sitting in the same place watching the sky turn crimson who will in turn be playing their own small part in its epic story.